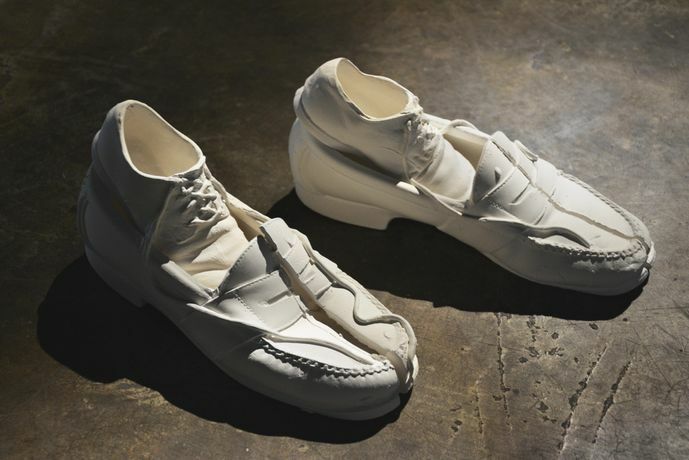 Smack Mellon is pleased to exhibit Beyond-Beyond, Ron Baron’s expansive installation of nearly one hundred pairs of life-size cast ceramic shoes. Smack Mellon is pleased to exhibit Beyond-Beyond, Ron Baron’s expansive installation of nearly one hundred pairs of life-size cast ceramic shoes. Although each pair is small in comparison to the gallery’s vast space, their combined poetic and ghostly presences fill the significant void and evoke all that is missing. In 2013, Baron’s family suffered profound loss. Until this tragedy, he had frequented yard sales and vintage shops, collecting the castoffs of strangers from which to create art objects. Only after he experienced tragedy did he truly recognize these items as signifiers of absence, full of layered meaning. The symbolism of objects inhabited by the spirits of their former owners took on great emotional depth. Shoes, in particular, became surrogates for people, vessels for souls, and triggers for memories.